If you see the 'Application Has Moved' error message, you can correct the problem by creating an alias for the application. Screen shot courtesy of Coyote Moon, Inc.
Adobe’s Creative Suite series of apps for the Mac brings many tools that the creative Mac user needs, including Photoshop, Lightroom, Illustrator, and Dreamweaver. But one item the Creative Suite can also bring is an annoying warning message that seems to pop up quite often, warning you about the Adobe applications having moved since the last time you used them. I’ve experienced this myself, predominantly with the current Mac version of Photoshop, but also going all the way back to the first CS version of the apps. "Application Has Moved: This application has been moved from the location in which it was originally installed. Some settings need to be repaired." The Adobe CS series of applications allows you to specify a location for the installation other than the default location, which is the /Applications folder. If you take Adobe up on this installation option, you may find yourself being reprimanded whenever you launch one of the CS applications by double-clicking one of its document files, or by specifying which application should be used to open a file. For instance, if you have an image you want to open in Photoshop, you can right-click the image and select 'Open With' and then 'Photoshop CS X' from the pop-up menu. If you installed Photoshop in the default location, all will probably be well, but if you installed it somewhere else, you'll see the dreaded Application Has Moved message. Don't bother with the Repair Now or Update buttons in the message; they won't help. Clicking either button will allow the application to launch, but it won't load the file you were trying to open. You can still use the application's Open command to open the file, but it's a bother; Adobe should have corrected this problem, which dates back quite a few versions of its Creative Suite, long before now. Adobe still hasn't fixed the problem, but you can. Here's how. To correct this issue, you must either reinstall Adobe CS to the default location or create aliases in the Applications folder that point to the location of the Adobe CS applications. Here's how to do that, using Photoshop as an example. Open a Finder window and navigate to where you installed Adobe CS. In our example, that location is /Applications/Adobe Photoshop CSX/, where X is the version of the Adobe Creative Suite apps. Open the Adobe Photoshop CSX folder. Right-click on the Adobe Photoshop CSX app and select 'Make Alias' from the pop-up menu. Move the alias to the /Applications folder. Repeat for each Adobe CSX application that is giving you the 'Application Has Moved' error message. Creating multiple aliases will clutter up your Applications folder a bit, but it's less time-consuming than the alternative, which is to uninstall and then reinstall Adobe CS. Another common problem that can cause the Application Has Moved warning messages is the existence of multiple copies of the Adobe CS apps on your Mac. This most often happens when you use a backup app to create a clone of your startup drive. With two or more copies of the Adobe apps installed, it's easy for the apps (and your Mac) to get confused about which location holds the apps you would prefer to use. 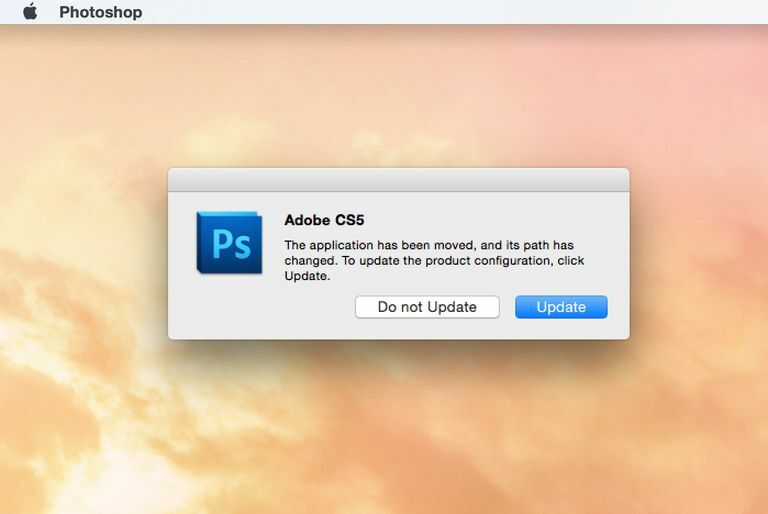 In this case, when the Application Has Moved message appears, you can click either the cancel or repair button, and a different copy of the Adobe CS app will be launched. It's easy to tell that it's not the Adobe CS app located on your Mac’s startup drive because a second Adobe app icon opens in your Dock, and if you use the Dock menu to Show in Finder, the app’s source will likely be the backup clone you made. Fixing this problem can be quite cumbersome; I suggest you try resetting the Launch Services database that your Mac uses to build the Open With menu. Even if you don’t have duplicates showing up in the Open With menu, this can still help with the Application Has Moved warning messages.